One fun thing about social media is that you truly just never know what interesting new thing you’re going to learn as you scope out your Twitter feed or check new Facebook posts. Here’s a little bit of game trivia that I picked up via Twitter this morning: the celebrated American writer Mark Twain once created a board game. The inspiration was a “game” of sorts that he’d created to help his young daughters learn the names and reigns of British monarchs for school. He’d created a path around the back yard with stakes in the ground representing different monarchs and years they took power, the space between the stakes helping represent the length of their reign. It apparently worked so well for the two young students that he translated it into a board game format but alas, one that was so complex and convoluted that someone compared it to an income tax form. So “Memory Builder” was not to be a pinnacle of Mr. Twain’s illustrious career. At least it got his daughters to do well with their British monarchs. This brings to mind information I read a few years back about how much playing games and doing crossword puzzles and otherwise tapping our brain power regularly can be such a boon to maintaining mental acuity later in life. In fact, on a cruise my husband and I just took, during which there were a couple trivia-game sessions every day, I overheard an older women next to me joking with her friends that she was playing along just to keep her brain sharp. More recent medical evidence isn’t necessarily so sold on the connection between playing games and doing puzzles, and staving off reduction in brain function with age, and diseases such as Alzheimers. I’m still going to keep playing games as often as possible, and when I’m beating the pants off my pals at age 93, you bet I’ll be giving a nod to years of game-playing for keeping my brain in gear. This link about the Twain story is from Mental Floss which, interestingly, isn’t just a magazine (and partner blog) full of fun facts and stories, but also is the namesake for one of the fun trivia games we have in our game closet: Mental Floss Trivia Game . The magazine’s an interesting and random trove of stories to please the most ardent knowledge hound and trivia buff. They get to the bottom of important aspects of modern life, like the origins of “cat’s pajamas” (love it!) in the current issue. The game riffs on the diverse pool of interesting information shared in print, claiming that “it’s funny, it’s quirky, and you’ll walk away a genius!” — at least one of you will, the winner usually feeling more “genius” than the rest. But we’ve had fun playing this game that tests all types of knowledge. Depending on this spot you land on, you’ll get a “Right Brain” question, a “Left Brain” question, or you’ll have to “Spot the Big Fat Lie” between two, often equally outlandish, proposed facts. The “Enlightening Round” spots on the board pull out a different card with a series of questions on a given subject, going from easy to most difficult. With all the trivia games out there, it can seem like a board game category that’s saturated and past its prime. 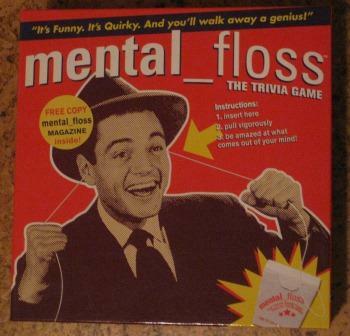 But we still love playing these games now and then, Mental Floss one we turn to regularly. It’s an easy-to-enjoy format that doesn’t take hours to complete, a fun way to test your mettle against the smartest of your family and friends.